Corn has it roots in the Cheyenne-Arapaho Land Run of 1892. Native Americans had earlier been able to choose their sites. Soon after a Mennonite Missionary at Shelly Took note of unclaimed land and invited German-Russian Mennonites of South Central Kansas to homestead in this area. Thirteen arrived and selected land along. Coffee Creek, Two miles west of present Corn. By fall of 1893, forty families had settled. More families came in 1894-1895. They brought the Turkey Red Wheat which would bring Oklahoma into the Wheat Belt of America. Present day Corn's Post Office opened at this site April 4, 1903 in the G,B, Flaming Store west of the Washita Mennonite Brethren Church. Eugen Forbes had earlier (1896) petitioned form Korn's Post Office north of this present site. 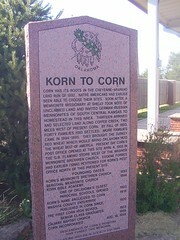 Location : Cordell, Ok East on OK 152, 15 miles to Ok 54 left 6 miles, left on Ok 54 A 3 miles, marker is in small park on right cormer of Main and Dewey. 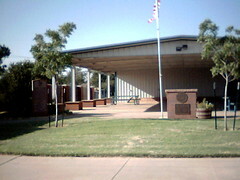 Corn Memorial Plaza Centennial Celebration 100 (seal) Pavilion and Names on Bricks of Sponsors of Plaza.